Date picker: the monthly calendar at the top of the control panel makes it easy to select a date to show in your current calendar view. List of sub-calendars: the Calendars section shows all active sub-calendars for your Teamup Calendar. Currently hidden sub-calendars are shown with white lines over their colored name bar. You can use the arrow next to the word Calendars to collapse the sub-calendar list. Filters: the Filter section contains a keyword filter box and a sub-calendar filter box. It will also contain a filter box for custom event field options, if you have created custom event fields of this type. The Filter section can also be collapsed. About box: the About box is a section containing information helpful to calendar users. You can customize the information it contains or disable it altogether in Settings > General Settings. This calendar has a collapsed control panel. Click the double arrow button to open the control panel. 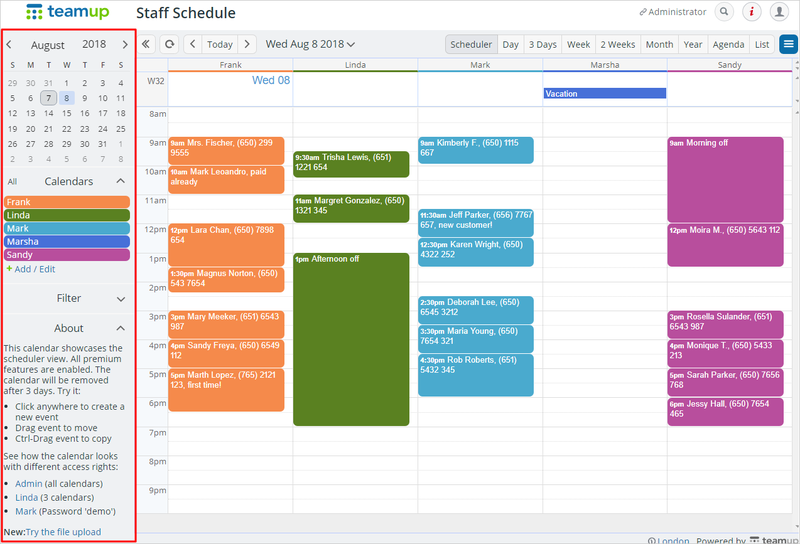 By collapsing the control panel, more space is available for your calendar and events. This can be especially useful for printing purposes. To show the control panel again, click the double arrow. 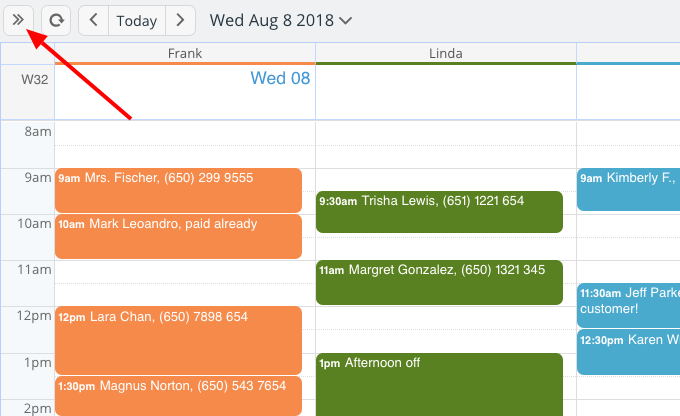 In scenarios where the available screen space for the calendar is very limited, it is recommended to keep the control panel collapsed by default. When embedding a Teamup Calendar in a website, it is often better to hide the control panel sidebar to allow for more space for the calendar entries to be displayed. You can use a calendar link with a parameter appended to it for this purpose.